Wachira Waheire strode into Nairobi’s Sankara Hotel, made his way to the café attached to its lobby and scanned the room carefully. He was meeting someone he had not seen in 20 years, but as he sifted through the faces in the café he was confident all he needed was a glimpse and he would recognize his guest. 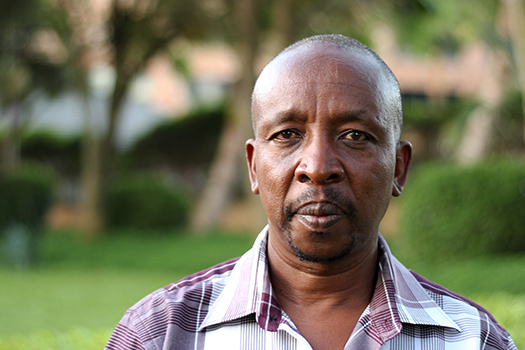 Wachira is something of a professional interviewer of torturers: as a Human Rights Officer at Kenya’s Truth, Justice and Reconciliation Commission (TJRC) from 2010 to 2012, it was one of his responsibilities to collect testimonies from victims and perpetrators of state violence in Kenya. As a survivor well-familiar with victims’ needs, he was uniquely suited to the role. But all his interviews hadn’t prepared him for this one. Wachira recognized his guest immediately. He steeled himself, then made his approach. He greeted the man warmly and invited him to sit, ordering a pair of ginger teas. Nerves dissipating, conversation flowed quickly and amicably, as it always does with Wachira: he has the kind of slow, infectious laugh that puts people at ease. The two men asked about one another’s families, their jobs and the paths their lives had taken in the decades since they had last seen each other. Chatting over their teas, they could have been mistaken for old friends meeting after many years. But it was immediately clear how much had changed since 1986, when their paths had last crossed. Then, Wachira says, this man “controlled my life.” He ordered Wachira to be stripped naked, had participated in beating him senseless, and coerced a false confession from him. He consigned Wachira to a hellish prison with the power of the state firmly behind him. In his heyday as a Senior Plainclothes officer, he had brimmed with confidence. The man before Wachira today scarcely resembled the ghost of those memories. He seemed haggard and downtrodden, a sleek suit replaced with simple, weather-beaten clothes. Had his facial features not been seared into Wachira’s memory after weeks held in the bowels of Nairobi’s torture chambers, the two might have passed each other on the street as strangers. The man himself was unemployed; ironically, it was Wachira who was now working for the state as part of the TJRC. It was now Wachira asking for answers, imploring his former torturer to testify before the commission. As they chatted, Wachira’s guest hinted that he had no way to get home. He couldn’t afford bus fare and it was too far to walk. Wachira didn’t hesitate, reaching into his pocket and handing him enough money to get home. The ride was on him. When Wachira says his life at one point depended on this man, he means it: at the time of his arrest in 1986, Daniel Arap Moi ruled Kenya with an iron fist. Moi ordered the Special Branch of the Kenyan police to round up all his enemies, real or perceived. Over the next two years hundreds of Kenyans, Wachira among them, were taken to the Nyayo House, a now-infamous government building in Nairobi home to a torture center. There, they were subjected to horrific violence at the hands of the security forces– people like Wachira’s future tea companion – who sought to coerce “confessions” to trumped-up charges. Once victims confessed to their role in these fabricated crimes, they were passed onto compromised prosecutors and magistrates, who then stage-managed sham trials. Most of these trials lasted mere minutes, culminating in stiff prison sentences. And that’s just those who made it out of Nyayo House alive. Not everyone did. Wachira survived, but his life today is radically different than the one he lived before his arrest. In 1986, he was a young professional with a wife and infant daughter. He had graduated from the University of Nairobi two years earlier and had landed a promising sales and marketing job. His life was comfortable and, for the most part, secure: while he knew that Moi’s regime abducted and tortured those suspected of being political dissidents, he felt safe because he was not an activist at the time. The accusation was baseless, but that didn’t matter: Wachira was whisked from his office in Nairobi’s industrial area to his house, where police conducted a thorough search without a warrant. From there he was taken to the nearby Jogoo Road Police Station before finally being transferred to the Nyayo House late in the evening. Amidst the damp, putrid halls of the torture chambers, officers stripped him naked and began their gruesome, systematic work. Beatings with tire strips, broken table legs, chair legs, and hose pipes. Merciless slaps, kicks, whips. Death threats that carried the weight of the lives already claimed by the state. The next 16 days were hell for Wachira, and what emerged was a broken man and a false confession. But the veracity of the confession was beside the point. Police dragged Wachira before a magistrate for a perfunctory hearing just before Christmas. The ruling was handed down in less than ten minutes: four years in prison. In 1989, Wachira was released from prison to find his old life had vanished. His promising career was no more. His sense of security had evaporated. Not knowing what else to do, he retreated from Nairobi and returned to his family’s farm in relative solitude. At the start of the 2000s, though, things began to change in Kenya. Moi was constitutionally barred from running for President in 2002, and while his former Vice President Mwai Kibaki won the election, the removal of Moi signaled a major change in Kenyan political life. The new government began to shed some light on the abuses of the past, at least relative to the previous regime. Among other steps, it threw open the doors of the Nyayo House basement torture chambers, exposing a portion of the state apparatus designed to exert power through brutal means. However, while the new regime took steps to expose the truth, it was slow to provide redress and implement reforms. Police and security forces remained a feared institution in the country: they continued to commit unlawful killings and were the most corrupt agency in the government, according to a 2005 study. In 1989, Wachira was released from prison to find his old life had vanished. His promising career was no more. His sense of security had evaporated. It was during this time, in 2002, that Wachira returned to Nairobi. He began attending meetings with others who had been tortured, and eventually, the National Victims and Survivors Network was established and Wachira was elected its Secretary. One of the key claims Wachira and his fellow activists demanded was reparations. Reparations payments would help these survivors meet their immediate needs, allowing them to get by as the country continued to grapple with its past. The group met with the Attorney General and asked when they could expect compensation. The Attorney General’s office pleaded for patience. Wachira and his fellow victims were willing to be patient with the Attorney General and the new regime, but refused to be strung along. Delay after delay followed the state’s initial promise, and it seemed to Wachira as though reparations were never going to be come. By 2003, he had finally had enough, and took action: he together with other survivors sued the Attorney General for reparations for the torture and wrongful imprisonment they had endured in the 1980s. It’s true: Google “Wachira Waheire v. Attorney General” and the case will be splashed across the web and cited in books. Wachira is humble by nature, but his pride bubbles to the surface when he talks about the trial. It’s easy to understand why, given the gauntlet of legal and emotional challenges he faced in pursuing justice, and the precedent he set in seeking reparations in Kenya. Wachira filed his suit alongside fellow survivors in November 2003, and at first it looked like they would settle out of court – both the Minister of Justice and the Attorney General had promised an amicable resolution. But after years without any progress in negotiations, Wachira elected to move forward with court proceedings in his own case. The trial route did not prove to be much faster. On Wachira’s first day before a judge, in 2008, his attorney moved to “stand over” the case; in other words, to delay the case indefinitely. He hadn’t consulted Wachira before he did so. Wachira felt betrayed, but he had come too far to be stymied by a legal maneuver: he confronted his lawyer outside the courtroom and relieved him of his duties. When the case resumed, Wachira decided he wouldn’t hire a lawyer at all. Instead, he would represent himself. With no formal legal training, he was now set to square off against the Attorney General. “It felt like a David vs. Goliath battle,” Wachira says. When the case resumed in 2009, representing himself in court proved to be as much of an emotional challenge as a legal one: in a cruel twist of bureaucratic fate, the courtroom he presented in shared a wall with the chamber where he was sentenced to prison in 1986. The chamber his torturers dragged him into. The chamber his forced confession condemned him. The vivid memories flooded back to him as he approached the stand. “It was going through my mind, that it happened right there, just 15 meters away. And I was just praying that what was happening now would be very different from what happened in the lower court,” Wachira says. His prayers would be answered. Gone were the torturers dragging him in; they were replaced by Wachira’s family. Gone too was the menacing Chief Magistrate swayed so easily by a false confession; he was replaced by a legitimate legal system. The outcome reflected this new reality: once the case restarted, the judges quickly found the state responsible, and saw that justice had not been done. They awarded Wachira Kshs.2.5 million ($2,906 USD). He was vindicated. Wachira won his case in 2009, but as he slogged his way through the multi-year court battle, Kenya slid back into a cycle of abuse. In 2007, amidst the lack of reforms and failure to address past human rights violations following Moi’s departure, state violence re-emerged as a serious problem when a contested presidential election degenerated into violent conflict. Over 1,100 people were killed and the country faced widespread destruction and displacement, with police and state officials once again implicated in serious violations. When the conflict finally subsided in 2008, the country launched the TJRC to address this legacy once and for all. Its mandate: to investigate human rights violations and other injustices perpetrated in Kenya dating back to the country’s independence in 1963. It was this mandate that first attracted Wachira to the TJRC. He was propelled forward by his experience in the Nyayo House torture chambers and wanted to understand it all: his country, the men who tortured him, himself. The TJRC proved an effective vehicle for these sorts of conversations, and Wachira joined in 2010. The Commission, while far from perfect, was a critical step in Kenya’s transitional justice process. It offered important findings on the root causes of violence and offered a wide range of recommendations to provide accountability and redress for victims. It was during his tenure with the TJRC that Wachira first sat down with his torturers as a free man. And while he was nervous walking into the Sankara Hotel for that initial conversation, he soon sought to speak with more of his torturers. He has since paid visits to the homes of two other former senior police officers who participated in his torture. He traveled to the gravesites of two others. He even met with the nephew of another—a nephew who, a chagrined Wachira explains, had no idea his uncle had been involved with any kind of state violence. Hearing the truth directly from his torturers has been hugely important for Wachira. Wachira speaking at a victim's conference in Nairobi in March 2017 (KHRC). Wachira served with the TJRC until 2012, just before the commission submitted its final report to the president and the National Assembly in 2013. The report included recommendations to secure justice and a stable peace in Kenya, such as a framework for reparations distribution and calls for memorialization. However, in the four years since, the National Assembly has neglected to adopt the report, officially recognize the commission’s findings or implement any of these recommendations. Moreover, other government promises have languished unfulfilled: in March 2015, President Uhuru Kenyatta pledged to create a 10 billion Kenyan shilling ($110m USD) restoration fund for victims, none of which has been distributed. Victims are of two minds regarding the delay in the delivery of these state pledges. “Some are hopeful that Kenyatta’s promise will be fulfilled while others feel like they were taken for a ride,” Wachira explains. Since concluding his work at the TJRC, Wachira has poured his efforts into activism with his fellow survivors at NVSN. Together, they are working tirelessly to hold the government to its promises and fulfill victims’ rights once and for all. Wachira is at the heart of this work, organizing conferences, protests and petitions that demand justice Kenyan victims. Beyond the adoption of the TJRC report and the distribution of reparations, the organization stresses the importance of memorials for the violations committed, both to acknowledge victims and to prevent their recurrence. Progress is slow but Wachira is undaunted. It took more than two decades to win his own court case, and longer still to approach the truth through the TJRC. He understands the broader fight for victims’ rights in Kenya may be even longer. But he remembers the feeling of winning his own case—winning acknowledgement and a measure of justice—and is resolute in seeking it for his comrades. “This is a lifelong struggle,” he says.